One gem I have unearthed as an intern in the education department at Memorial Art Gallery is the selection of religious objects owned by MAG that are available to be borrowed at no cost by area educators. 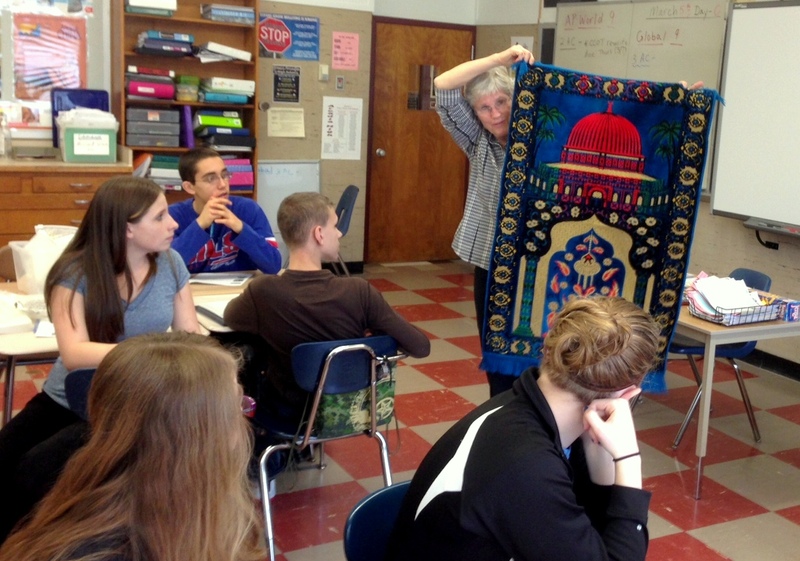 The objects are contained in kits in the Teacher Resource Center and represent five major world religions: Christianity, Judaism, Islam, Buddhism, and Hinduism. Religious artifacts, holy books, and contemporary tools for worship are some examples of the variety of objects, and they all provide students with an intimate view of the faith from an insider’s perspective. I had the opportunity to observe these kits being used by Kendra Damann’s ninth grade AP global history class at Greece Arcadia earlier this week. The students applied the theoretical knowledge they had from previous course work to analyze and interpret the objects. I saw awesome collaboration between peers, connections being made to prior knowledge, and a genuine interest in seeking out more information about the objects they were holding. 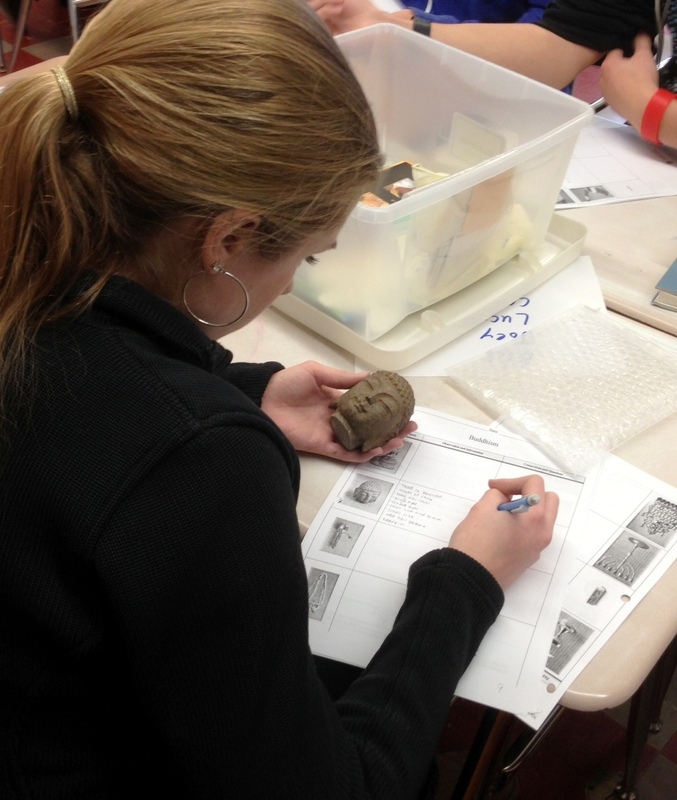 In this photo (above) a student uses visual clues from the Buddha head sculpture to remember ideas learned earlier in class. 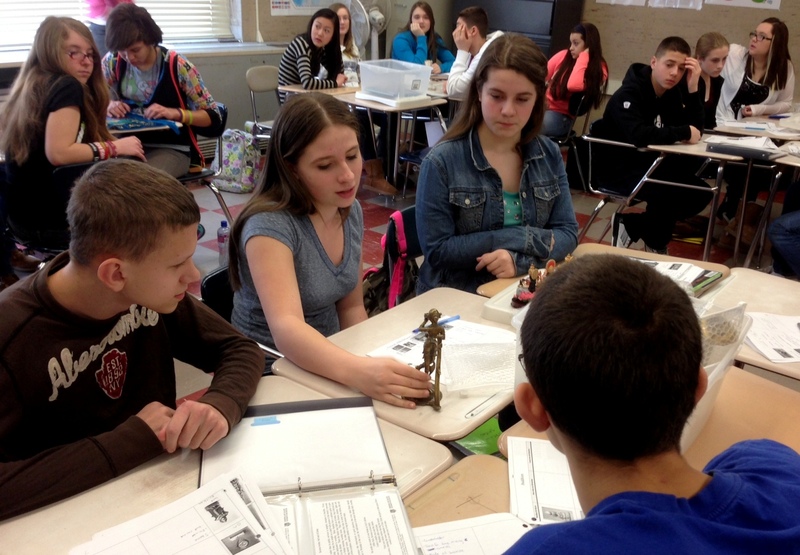 Students used personal background knowledge and information they’d learned in school to teach each other about the objects. 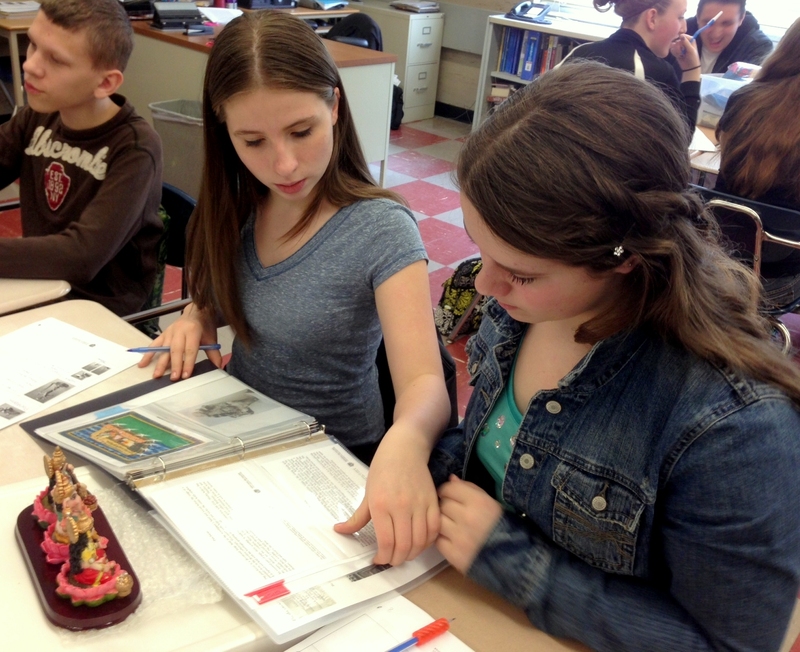 Students used the kits’ educational materials to discover new information about the religions and their objects. denied his basic rights, simply for being Muslim. The religion kits (which include the objects as well as thorough descriptions and lesson plan materials) are in portable tupperware containers located in the Teacher Resource Center of the Charlotte Whitney Allen Library. If you have any questions about the kits and their availability, please call the library staff at (585) 276-8999.